...and Hurricane Sandy. Hurricane Sandy was roaring up the East Coast. With the hurricane making its move North we experienced some high winds on our Sunday trip. The outreaches of Sandy produced 15-20 mph winds on the river, with gusts of 20 + mph. What is a person to do with winds this high and temps in the mid 50's? Go fishing anyway. Richard, who owns The Timothy Demonbreun House, which is named after his Great, Great, Great, Great Grandfather, who was the ”The First Citizen of Nashville” and “The Patriarch of Middle Tennessee”, made time to spend a day on the river with his son Timothy. Timothy had never fly fished and with the wind this day would have its challenges. But, before the day was over Timothy achieved a good distance casting and he was casting with accuracy. Also he learned "how to fly fish", which is a whole other ballgame. I told the guys before leaving the ramp "if you learn to cast on a day like today, a normal day will be a piece of cake." We started with a roll cast, then went onto basic casting, and casting into the wind. Naturally we worked on mending and achieving a good drift along with hook-set, then we worked on catching fish. We fished structure early. The fish were tight to the structure and tight lipped. Mostly we worked on the basics, but we still wanted to catch fish. We moved to the middle of the river and within a couple minutes Timothy was hooked-up with a feisty brook trout. We snapped some photos and moved on. Something happened between the first and second fish. Somewhere within those next 10 minutes Timothy understood the different steps of fly fishing and how they apply to catching a fish with a fly rod. We floated into a section of river that is fairly shallow and heavily fished. Timothy's cast extended an additional 10-15' and he was mending properly. That's when he began really catching fish. One fish came to the net, then another and another and another. At one point each time I asked for a fly placement in a certain spot, Timothy would hit the spot and shortly he was rewarded with fish. The wind would prevent us from fishing some of the usual spots and at one point the winds from Sandy were making the water whitecap upstream. The guys stuck it out and as the float approached the 3/4 mark we tied on a Tutto. The Tutto has been a good Fall producer for us. The fly is made of everything that was laying on the tying bench late one night. Click Here for the back story on this fly. 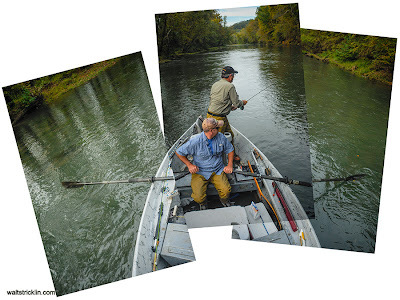 As we entered the 3/4 mark of our float, we pulled up to a spot in the river that has produced a fish or two and usually we don't have to wait too long for a response from a brown or a bow. We pulled in, Timothy stripped off some line, measured his cast and dropped the Tutto right where it needed to be. The indicator dove and Timothy set the hook. He slid the fish in the net and Richard commented "did we have an appointment with that fish?" That was one of the funniest fishing lines I have heard all year. 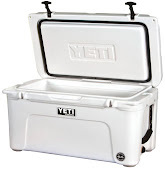 With that, we stowed the rods and made our way to the takeout, against the wind of course. If the day was measured by catching, we had a good day. If the day was measured by a father and son spending quality time together, well, this day was a great day. Fall is here and the colors are changing. The trips to the river, if one stops to take a look, are colorful and the sky is clear. The colors along the river's edge have peaked for the most part, but the fishing has not peaked. 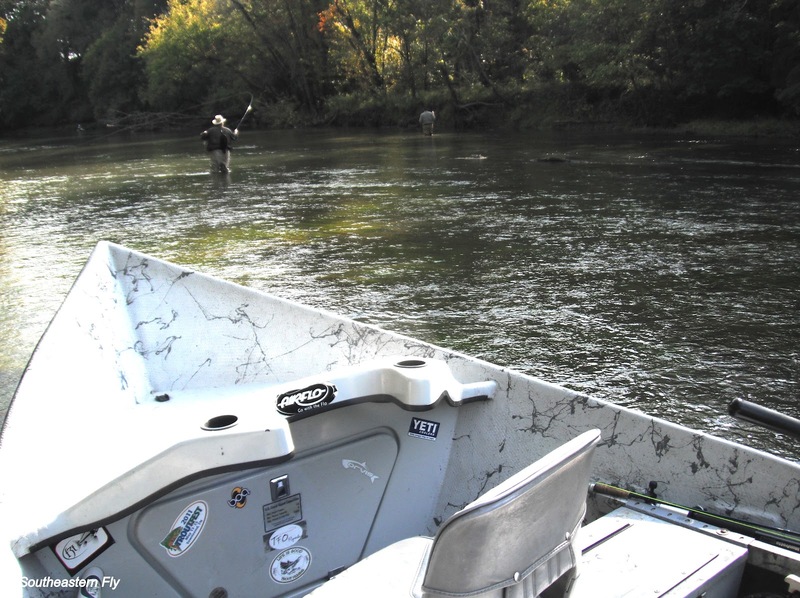 The Caney Fork River- Fishing has been good with a few short windows of low water opportunities. We have fished nymphs for the most part but there are still some fish, in some parts of the river, that will still take a dry. 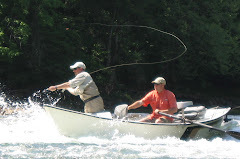 Be ready to strike the fish as soon as the fly hits the water. I say this because several times we have seen fish take the fly, both dry and nymph, almost immediately. The fish are opportunistic in their eating. The Bead or Not to Bead- I floated this week with Brent and Donnie. Brent is an accomplished angler who can put on a nymphing clinic if he needs to. Donnie has not been fly fishing long, but since he began fly fishing he has been fishing the nymph. If I had to compare the two anglers, Donnie is advanced in the regards to the short number of months he has been fly fishing, but Brent has an advantage over Donnie. I wanted to do a test that might add some value to future floats. We put a dry and a small glass bead nymph on Brent's rod and a regular bead head nymph of the same style and size, under an indicator on Donnie's. Then we fished a heavily stocked access point. The bead head fly won the test, hands down. Both anglers fished the same water, with Brent in the front of the boat so he got the freshest water. So what does all this mean? On this day on this water a bead was not the key to catching fish, but sure doesn't hurt to have a bead at the head of a nymph. No anglers were harmed while undergoing this test. If These Will Holdover for a Few Years! 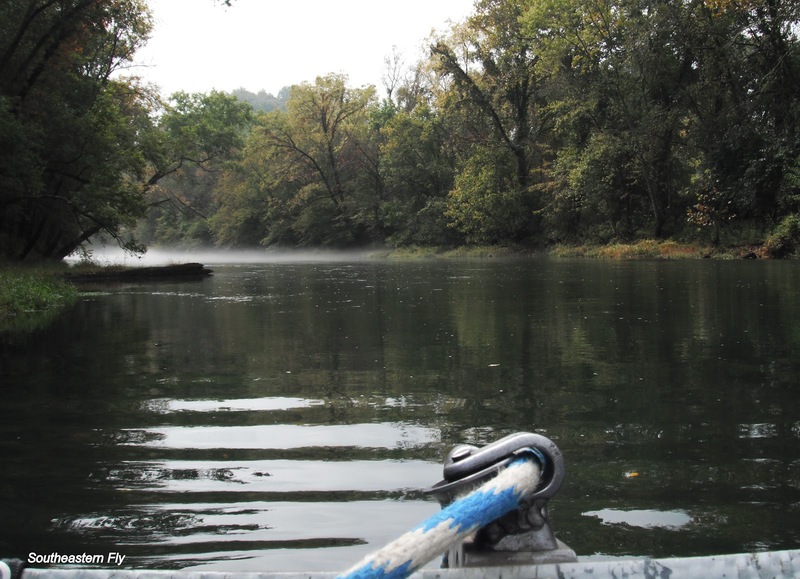 The Caney Fork River- Water levels have been the story over the past week. The Army Corps is releasing 5400-5650 CFS which is a generator and the sluice. The sluice is releasing water to add oxygen for the fish especially the fish in the upper portion of the river. Currently Center Hill Lake is dropping one foot every thirty-three (33) hours. The future generation on the river is calling for regular recreation releases by Friday. This should allow everyone to get their fix starting Friday and hopefully extending, at least, through Sunday night. The Elk River- With the Jack Daniels World Championship Invitational Barbeque coming up on Saturday, October 27th we may see a few more anglers on the river on the days before and after the event. TVA has been spilling water over Tims Ford Dam the past couple weeks. The river bottom has needed a good scrubbing and 970 CFS should assist with the cleaning. The current release is higher than we like to float. We should have a report after TVA dials back the release. Until then it looks like things are looking up for the Elk. Father- Son trips are a lot of fun and we have been on several this year. This time Craig and his son Conrad came in to fish from the drifter. We made the usual arrangements and would be floating by mid morning on a 1/2 day float. 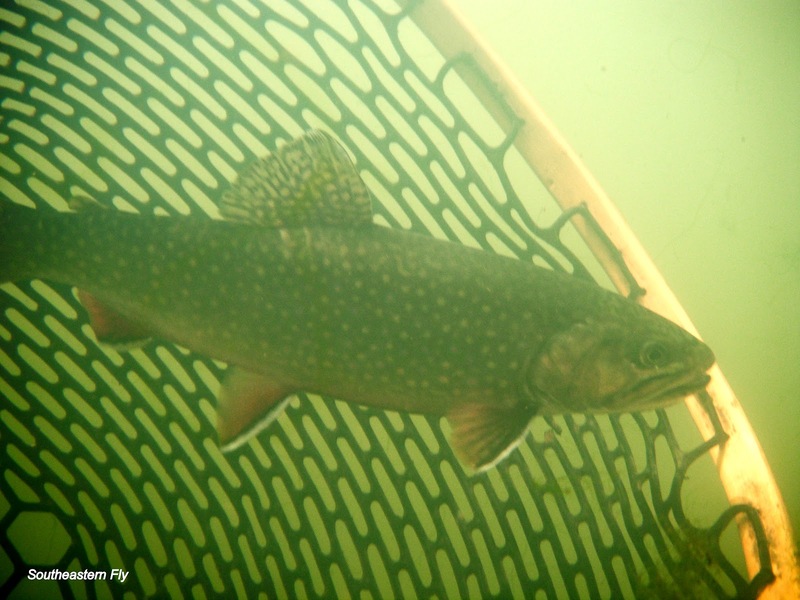 Our target would be rainbows, brook trout and browns, better known as The Slam.The day started out with rain moving from West to East...just like the Weather Channel Girl predicted. When we made it to the ramp the rain had pretty much stopped for the day. A cool breeze lingered as well as some clouds which were heavy at times throughout the morning. We shoved off from the gravel bar as we usually do and the flies hit the water. After the last trip I expected the fish to practically jump in the boat. But, the fish didn't jump in the boat they made the guys earn their strikes early on. At the beginning of a trip it usually takes time for me to get adjusted to anglers fishing styles and for anglers to get used to my fishing style. We went through the usual routine of cast to a spot, mend, mend, mend. Craig made an analogy of their fishing skills. He compared his and Conrad's skills to skiing and likened their skill to a Green Circle. When their flies hit the water and they made some mends, I decided Craig had already underestimated their abilities. Conrad said something about knocking the rust off his cast and soon we were fishing. Our plan was to fish only the likely spots so the guys could make it back for a dinner reservation. I told them up front, I am not a good time-keeper and certainly not good at getting off the water on time (whatever that means). As a matter of fact those words are even hard to say. Craig agreed to keep time and we would pace ourselves as best we could. It wasn't long before Craig removed the skunk from the boat and Conrad followed suit with a few fish of his own. We weren't too far into the trip when Conrad boated a healthy rainbow that came out of a tight spot in some heavy structure. Already the guys were hitting their marks and those marks were paying dividends. Conrad had quickly knocked the rust off, but also seemed to struggle with shooting the line. We made an adjustment to his cast and got a little more distance, but still the line wasn't shooting up to par with Conrad's mechanics. After Conrad went on a run of several fish we checked out his gear. He had a nice rod and quality reel, and we diagnosed the shooting problem as the old line. The line was slightly gummy and needed to be replaced. I brought along a couple extra set-ups and put Conrad on a 5 wt Hydros with Orvis line. He got used to the new set up quickly. A few minutes later Conrad wasn't only hitting the marks with increased accuracy, he was also shooting an extra 10' - 15' of line. We stopped the drifter while Craig fished a ledge. Conrad was fishing the opposite side of the boat and we had a couple fish rising along the ledge. Conrad dropped a midge along the ledge and a fish raced out. Just as the fish came out Conrad made a mend and the fish fell downstream and ghosted against the ledge. Conrad stuck the fly back in the same spot and just let it float. We saw the fish come off and nail the fly, the indicator dove and the fight was on. It took a few minutes to get the fish out of the structure but the fish came to the net and Conrad had a quality rainbow. Conrad had quickly graduated to a Black Diamond. We continued downstream and Conrad continued to pick up fish. Craig would get dialed in and pick up fish as well, but it appeared to be Conrad's day. We grabbed some snacks and gave ourselves some fuel. We skipped some spots and caught the usual suspects in most of the likely places. The sun was trying to come through the clouds and breaking on some parts of the river. That is when the bugs began to pop. Craig was still fishing hard, throwing the fly into every likely spot. Conrad was batting clean up from the back of the boat and picking up fish. We made our way onto a nice shoal, with several small pools and a heavy run. The rocks along the outside edge of the run produced some nice break water. Craig was focused and dropped his fly on the seam closest to the bank. The fly floated and we watched. The indicator dove and Craig set the hook. After missing a few fish with a light hook-set, Craig dug in and ripped some lips on this take. The indicator moved and then stopped, Craig gave another pull and the rod kept the same bend. Was he hooked on a log or a rock edge? The rod tip made a few small dives and then the fish was on the move. Not only did Craig have a nice fish, but there was also another nice fish following close behind. Craig finally got his fish close enough to see the other fish was tailing his catch. We noticed the fish Craig had on the line was the larger of the two. Our plan was coming together. Craig continued the game of tug-of-war. The big rainbow would make a run and Craig would gain line back. The rainbow would sit and sulk and Craig kept the pressure on. Craig pulled the rainbow from the run and the rainbow kept inching back. Head shakes, big rolls and sulking were this rainbow's ammunition. But, Craig got the head up and the fish finally rolled over into the net. Craig was into a quality fish in a big way and made his way into the 20 + Club not to mention graduation to a Black Diamond rating. We continued toward the takeout and the time slipped past. The dinner plans were acknowledged and the flies continued to be launched. The guys were still into the fish and the indicators continued to dive. As we floated into the final section we decided to call it a day. The guys wouldn't be too late to the dinner. If anglers measured skill, by ski run difficulty, Craig and Conrad would have started out much better than a green circle and certainly earned additional levels throughout the day. Hopefully they made it to dinner on time, hopefully they can get their fun tickets punched again and hopefully those likely spots will hold other nice fish. First off, all trips are unique. The weather, water levels, wind, sun and people make the trips what they are. This trip was a lot of fun. It started when Bryon emailed to book a date for himself as well as his friend Keith. Bryon is a seasoned veteran and Keith had not fished before so he was our rookie. Bryon stuck the first fish and got the skunk off the boat. Keith was working on casting, mending, mending and if you have ever fished in the drifter with us, well you know I worked him over until he mended just the way I wanted. Keith found the casting groove with his new rod shortly after Bryon boated his brookie, Then Keith came in with a brown of his own. Then Keith went on to boat several fish. That's when we realized it was going to be Keith's day. It was crazy at one point, Keith caught a fish, I took the fly out of the fish's upper lip and tossed it back into the water. Before we could release that fish Keith had another on the line, without even casting. A short time later Keith was looking at Bryon while they were talking and Keith got a bite and set the hook, without even looking. That is when Bryon became known as "The Other guy". It was like the fish wanted to be caught by Keith. Don't get me wrong "The Other Guy" was catching fish, but Keith, well he could have been the Fish Whisper. We began to make fun of the number of fish Keith was catching. The Other Guy was picking his spots and bagging some fish on the nymph as well. Nymph fishing is more than just throwing a fly out there and watching the indicator. Nymph fishing is also about depth, current, seams and of course a proper mend. A decision of which way is the current pushing the line and the indicator? And is the fly in the current seam? Keith was doing everything right and he was racking up the numbers. As the day wore on we settled into casting, mending and sometimes catching. We were floating lazily down the river when Keith's indicator took a big dive. He set the hook and the feisty rainbow began jumping, diving and grinding on the bottom. Keith did his best to keep the rainbow on the line and out from under the boat, while The Other Guy looked on in disbelief...We had gone most of the day before we showed Keith how to properly bring a fish to the net. He received a crash course on this fish and we got it to the net without incident. We floated toward the take out and both guys had caught good numbers of fish on nymphs and midge patterns. On this trip the fish were not rising to the bugs coming off. The were deeper and looking for moving water. Keith and Bryon were both dialed in and made this day a good day to be on the water. Thanks guys it was a lot of fun for the guide too and I am looking forward to doing it again! Curtis called a few weeks ago and wanted to set up a trip, but I was already booked for that day. Fast forward a couple weeks ago Curtis sent me an email and said he wanted to get out on the river and he said his friend Walt would be joining us. 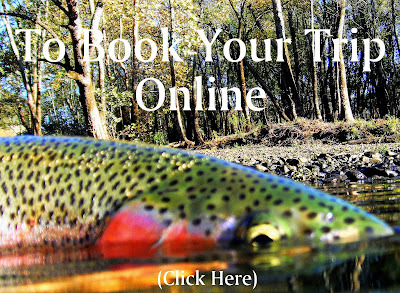 Curtis is a longtime angler and had booked us a few different times over the past years. This time Curtis and Walt would make a fast trip from Hoover AL to Middle Tennessee for an all day float and return to Hoover that evening. I told Curtis about the current water conditions and we nailed down the particulars of day including rain gear and lunch plans. We met at the river and while I ran the shuttle, Curtis and Walt pierced the lips of a group of hatchery brats. Then we pushed the drifter into the flow of a river stained from the previous evening's rainstorm. Curtis had some different rods to try and Walt was warming up, after not having a chance to fish for a couple years. We worked briefly on Walt's casting, but after seeing improvement from just a few instructions I shut up and we fished! Walt hooked up on the nymph while Curtis threw his favorite streamer pattern. It sure didn't take Walt long to hook up with a nice little stocker brown. We have been trying a few different nymph patterns and sizes over the past several trips. The results have been above average with some patterns while others were simply dismissed. Walt dialed in to the right drift and the fish began to respond. Some fish were caught and some were missed, but Walt did a nice job with nymphing. We talked fishing and photography while Curtis fish some moving water. Walt is an outstanding photographer and gave me some pointers on my photos. In the meantime Curtis was back to his old tricks of casting that streamer. Curtis has a laid back but direct style and his casting mirrors his personality. We stopped at several shoals throughout the morning and Curtis brought fish to hand on every stop. Curtis has the beginnings of the Musky Bug and has already bought a bigger stick to scratch the musky itch. We continued on to the lunch spot and then fired up the grilled and cooked a cedar plank with a salmon on top. After lunch we spoke to some folks in canoes and Walt boated a nice rainbow right before we got into their water. It's always nice when an angler catches a fish in front of someone. We released the rainbow and finished the conversations, then we moved onto one of my favorite pools on the river. We came to a grinding halt on the shoal and the guys started fishing the run and the pool. They caught fish on this stop too and the action made us forget the naps we were discussing after lunch. We pulled into the gravel bar at the ramp and found a guy fishing the small pool where we usually load the boat. He was catching trout and taking them out to the mainstream of the river. It was sort of like trout-rescue and he was doing a great job. We found a spot off to the side and put the drifter on the trailer. Our day of fishing was over for the most part. It was a good day on the river with a good number of fish. Both guys got the slam and we boated a couple other species just for good measure. Then Curtis and Walt got back to their vehicle to finish off their fast trip from Hoover.